N/S Savannah: worth seeing, worth saving – and, worth every penny spent to do both. Baltimore, MD: As the Editor of both Maritime Logistics Professional and MarineNews magazines, I flatter myself that I have – perhaps like no one else covering maritime business – a unique lens into the vast diversity that exists from one end of this fascinating business to the other. Drilling down a bit, and on the domestic waterfront, there’s arguably no bigger contrast in coverage assignments than, say, attending the exciting MACC Show at Curtis Bay, MD on one day, and then stepping aboard the nation’s first and only entry into the world of nuclear powered merchant shipping on the next. But, that’s exactly what I did in late July, on two successive days. On Wednesday and Thursday, I was zipping along and being treated [?] to tight corners at 50 MPH on the nation’s most advanced littoral, patrol and special mission craft. It’s not for the faint of heart. 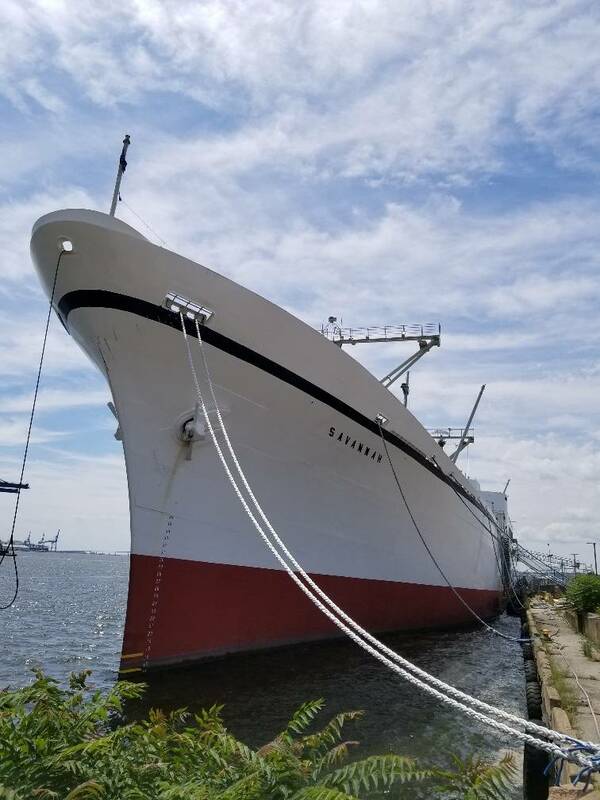 Friday brought a more sedate, yet equally interesting assignment, as I boarded the now idle nuclear ship Savannah, moored quietly and obscurely along the Baltimore waterfront. I simply love to tour the old ships. Separately, and in 30 years of trying, I have yet to manage to get on board the museum ship and former Great Lakes bulker Mather. 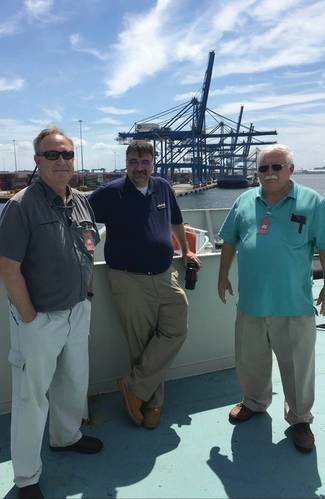 This tour proved a bit easier to arrange, and my gracious hosts at Marad made sure the trip was worth the wait. It ain’t easy to find. And once off the freeway on the Baltimore waterfront, well, it isn’t the best neighborhood. Beyond this, you need to make a few random turns past and through some dry cargo docks, navigate the detour, and along the way, slap the GPS a time or two when it gets confused. Harkening back to my days as a cargo surveyor (long ago and far away) I remembered that any trip to perform a draft survey typically involved the requisite flat tire after you’d run over about six million nails and assorted dunnage on the way to that assignment. Not to worry; no flat tires this time and we arrived on the pier on time and just as we crawled down the pier towards the remarkable vessel, a worried Rodney McNany was ringing up my cell phone to inquire as to where we were. I told him to look out the porthole. At my side in an unofficial, but helpful role was Robert Murphy, the former Director, Office of Resource Management, for the US Naval Nuclear Propulsion Program. As a matter of full disclosure, he’s also my Brother-in-Law. When I told him, some weeks prior, what I was intending to do, he readily agreed to come along for this trip down memory lane. Our guide, Marad’s Erhard Koehler, was the perfect host and perhaps the guy who knows more about the N.S. Savannah than anyone else on the planet. At the same time, I could also ask for no more knowledgeable nuclear energy SME than long time [now retired] SES USN executive Bob Murphy. And in places where I maybe found one piece of minutia just a little dull, he instead asked the right questions and showed me what was important, and why. Sandwiched in between Koehler and Murphy for this two hour tour, with the watchful and helpful Marad PAO [Rodney McNany] in tow, I got a real sense of just how important this piece of history is, and why it should be preserved. Still NRC-controlled to this very day, the Savannah has few peers when it comes to her fine, sleek lines and pleasing naval architecture. Contrasting sharply to today’s floating bathtub-shaped cargo ships, it is easy to spend 20 minutes on the pier just admiring her lines. And, that’s just what we did, once having disembarked after the tour. Even lacking a recent paint job, Savannah is a handsome addition to the gritty Baltimore waterfront. You can only imagine how she might look in a more accessible, tourist friendly locale. Bob, of course, wanted to see the engine room. Ever the deckie, I wanted to see the bridge and wander around on deck. Eventually we did both. But first, we mustered in a nicely appointed and restored reception area just inboard of the main gangway area, where Erhard Koehler, the U.S. Maritime Administration’s Manager‎, N.S. Savannah Program, brought us up to speed with a safety lecture and then some general fun facts about the grand old boat. It was right about then that my brother-in-law mentioned to Koehler that, as a young boy growing up in Rhode Island, he had toured the Savannah when she had called at Providence. As he spoke, Koehler nodded vigorously and then led us around to the other side of the vessel to show us an exhibit that contained a photo capturing the vessel’s transit through Narragansett Bay on that very day, so long ago. For his part, Murphy was noncommittal as to whether the experience had prodded him on his way to a distinguished, 40-year career in the U.S. Navy and the U.S. Department of Energy, where he worked for Admiral Rickover for much of that time. We’ll never know. It was nice, nostalgic moment. Also right about then, I was suddenly glad that I had brought him along. The décor was intended to be uniquely American; Koehler describes it as “mid-century modern.” Let’s go with that. That comes complete with gallons of lead paint and excellently coated asbestos. Some of this has been removed, and some, apparently, is better left encased and otherwise undisturbed. As we toured the vessel, Koehler pointed out that a great deal of restoration had taken place already, most of which had clearly and carefully been executed with an eye toward preserving the original motif. If so, they have done a nice job. For example, some ornamental tiles on the decks and stairwells are exact replicas of the old asbestos tiles. A trip through the crew’s quarters revealed no surprises and the better preserved rooms would be familiar to any American merchant mariner, right down to that ubiquitous, institutional green paint slapped on the bulkheads. During this part of the tour, I admit to experiencing a serious and depressing flashback to my days at sea, but I recovered quickly and rebounded nicely once out on deck. As far as the nuclear plant was concerned, Koehler explained that there was relatively little risk in the vessel’s operation. A collision barrier – far more robust than most would have thought – in the vicinity of the reactor and dome, saw to that. The vessel stopped carrying passengers in 1965. Originally, it was fitted to accommodate as many as 190 people, including 65 crew. Ultimately, the vessel’s service ended in 1970, mostly due to budget issues. The vessel’s navigation bridge and engine control room were, of course, two of the tour’s highlights. And having sailed on my fair share of U.S. flag, 40-year old rust buckets (and that in no way describes Savannah), I was right at home in the vessel’s Spartan wheelhouse. The bridge had a “Scram” button, something which basically was the shutdown for the reactor in times of emergency. But for the deckies – and apparently this was a point of some discord – the button only allowed them to alert the ER – not actually activate it. In the engine control space, a light would come on, alerting the engineer on watch, who would actually do the heavy lifting. As a former deck officer, I think that this was probably (very) good policy. There are a lot of myths and sea stories about the boat, some of which are at best exaggerations and most, simply not true. Koehler did his best to sort them all out as we made our way on this journey through U.S. maritime history. In the beginning, it was U.S. President Dwight Eisenhower’s vision that brought the ship to life in the first place. “Atoms for Peace,” he called it. It was, in his way of thinking, the perfect way to demonstrate to the general public the possibilities of nuclear capabilities for the greater good. In its purest form, the vessel allowed the United States to explore the possible introduction of nuclear propulsion into commercial shipping, and helped discern the rules of flag states and the bilateral agreements that might evolve. It was never intended to be a big moneymaker, and it that regard, it did not disappoint. That’s because, in part, the vessel’s overriding mission displaced space that otherwise would have been used for cargo carriage. That said; Koehler insists, it made more money than some thought it would. Labor trouble dogged the vessel during its lifespan, so in that regard, it (arguably) stayed true to its heritage as an American merchant ship. Pure and simple, the ultimate goal of Marad for Savannah is donation. 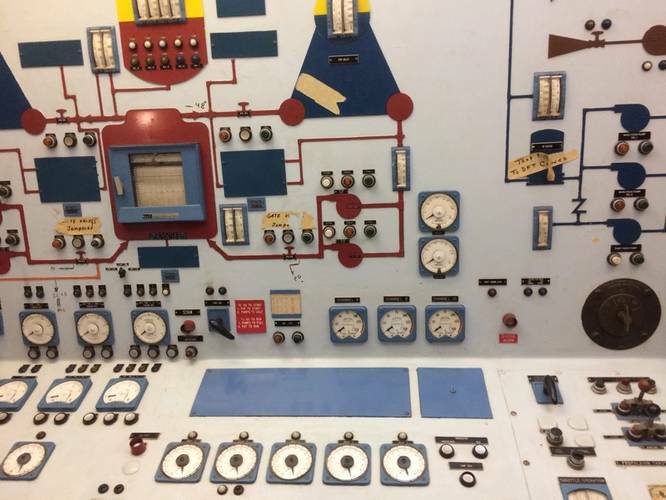 Koehler told us firmly, “We’re not a museum operator.” Under the control of the Nuclear Regulatory Commission since 1965, the vessel has long had its fuel removed. Eventually, Marad’s plans are to decommission it and terminate the NRC license. 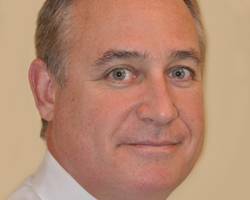 A $131 million decommissioning project is now fully funded, says Koehler. The decommissioning phase, which began on October 1 of last year, will reportedly last for 7 years. Next up on the calendar, a 3 to 4 month drydock period is planned for next year. Today, the boat doesn’t host a lot of events, but occasional functions, most notably some National Maritime Day celebrations and other similar, educational events have been held on board. In fact, as many as 45,000 people have visited it one day on previous occasions. Our late July tour was a special treat, one which should be a ‘must-see’ for any ex-mariner, if Marad has its way for this vessel’s ultimate destination. August 21 will be the 59th anniversary of the Savannah’s launching, and there is excitement in the air on board as that day approaches. On July 20, Erhard Koehler was the right host for our tour – a veritable encyclopedia of all things Savannah. An apt manager, he is also the perfect ambassador for Marad in his current role. They’re lucky to have this Fort Schuyler graduate on board. Today, the N.S. Savannah is the perfect candidate for what hopefully will be its next life as an appropriate guardian of American maritime history. Whatever entity eventually takes possession of her will be similarly fortunate. There are more famous and high-profile maritime candidates for renovation and preservation in the news today. Notably, and just up the I-95 Freeway, another famous merchant ship and its stakeholders are vying for the exact same thing. But, Savannah is unique in its compact scale, its possibilities and the ultimately minor cost that will bring it to life as a museum. And unlike the other Philadelphia-based icon, the U.S. Maritime Administration has already done most of the hard work necessary for its next owner to take the next step. Here’s hoping that’s something that will happen very soon. – MLPro.